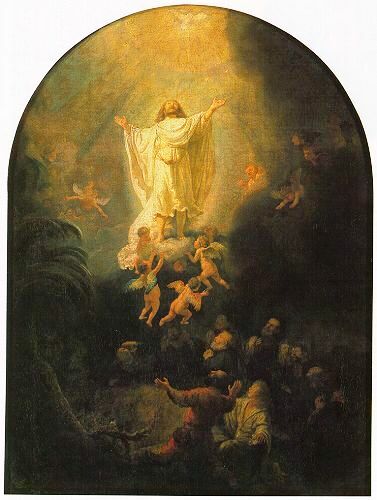 The Ascension of Christ, Rembrandt. "When they therefore were come together, they asked of him, saying, Lord, wilt thou at this time restore again the kingdom to Israel? Which also said, Ye men of Galilee, why stand ye gazing up into heaven? This same Jesus, which is taken up from you into heaven, shall so come in like manner as ye have seen him go into heaven." Stories of Ascension to the heavens were common in the ancient world and represented the means by which a great prophet or exceptionally righteous person could become immortal or deified. Among the Jews, Enoch, Ezra, Baruch, Levi, Elijah, Moses, and the children of Job were all said to have ascended. Also, Krishna, Buddha, Zoroaster, Adonis, Hercules, Romulus, and even the emperor Augustus were said to have ascended to Heaven. One could regard stories of resurrection and ascension as representing the universal solar myth, depicted as the journey of a mythological hero through phases of separation, transformation (initiation), and return, mirroring the cycle of birth-growth-decline-death-rebirth that is present throughout nature. In this sense, the lesson of the solar myth is the Law of Nature, which suggests immortality.
" 'To know what is necessary for ascent to the heavens; to travel through all that is in the seven heavens, to behold all the signs of the zodiac, and . . . sun . . . moon and (stars); to learn the names of the [angelic] guards of each firmament and their work and how they manage everything, and what are the names of their servants, and what libations are to be made to them, and what is the time [in which each of them] will consent to do whatever is asked by anyone who approaches them in purity.' "
"Let the immortal depths of the soul be opened, and open all thy eyes at once to the Above, for if the mortal draw near to the fire he shall have light from God. Thou shouldst speed to the light and to the rays of the Father. And when thou beholdest the most holy fire, flashing formless with dancing radiance through the depths of all the worlds, then listen to the voice of fire. Believe thyself to be out of body and so thou art; for divine things are not accessible to mortals who fix their minds on body; it is for those who strip themselves naked, who speed aloft to the height."